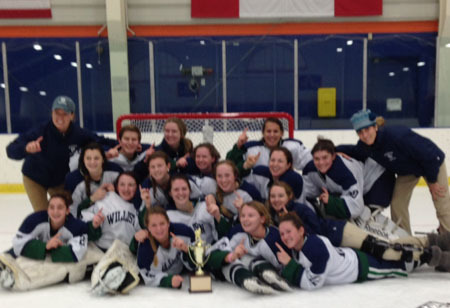 This was a historically strong winter for the Williston Northampton School, with teams winning championships, setting records, and securing personal best times. On Wednesday, March 25, the Williston community came together to honor all of these amazing achievements, and to also recognize the team award winners. Winter highlights included the boys varsity basketball team securing the NEPSAC Class A tournament title. Coach Mike Shelton was named the NEPSAC Class A Coach of the Year and Ryan Richmond ’15 was named outstanding player of the tournament. 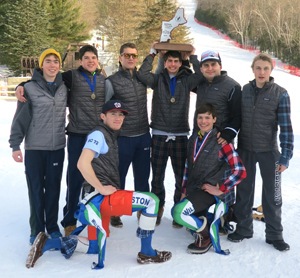 Boys skiing also won their NEPSAC championship, securing the title for the first time in 22 years. The swimming and diving teams had incredible record-breaking seasons. On the boys’ side, David Fitch won a NEPSAC title in the 100 yard freestyle and finished second in the 50 yard freestyle (with the third-fastest time in school history). Gabriella Mercier what was described as the single greatest season in Williston diving history, breaking the school’s dual meet diving record and championship diving record. Sally Alrutz, Natalie Aquadro, Jasmin Movassaghi, and Emily Yeager broke a 15-year old record in the 200 medley relay; Ms. Alrutz, Ms. Aquadro, Ms. Yeager and Anabelle Farnham broke the 400 freestyle relay record by three seconds; and Ms. Alrutz re-broke her own record in the 100-yard backstroke. She also broke a record in the 100-yard butterfly, and set a new NEPSAC Division 2 record on her way to winning her first NEPSAC title. Wrestler and senior captain Sam Atkin had a third place finish at New England’s (after being a sixth seed), while boys squash took second place at the Class C New England Tournament with a first-place overall for Loren Po ’15. 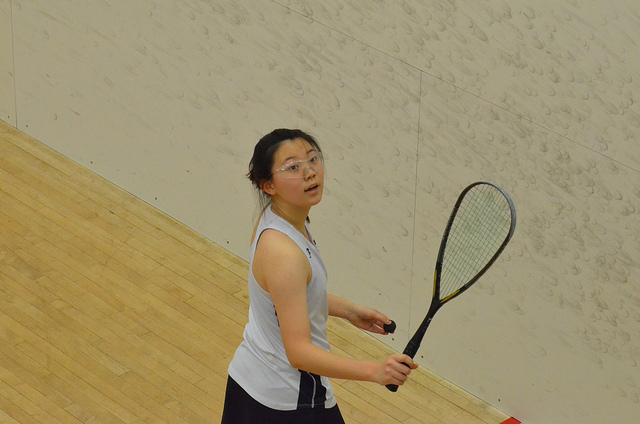 Girls squash took third place at the NEPSAC Class C Championship, with senior Hannah King winning three matches to take first place in the #7 flight. The girls also received the tournament’s Sportsmanship Award. 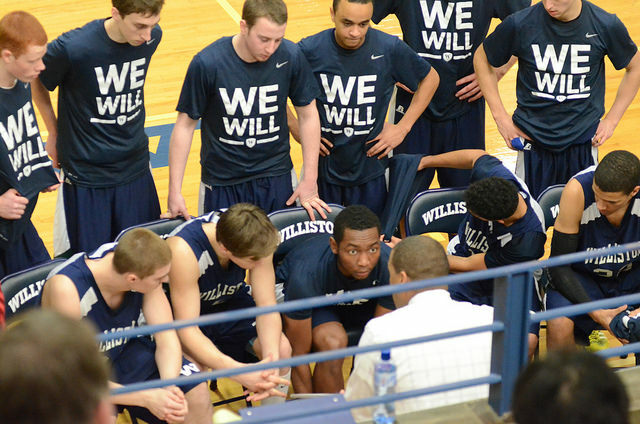 “Wow, what an incredible winter season it was for Williston Wildcat athletics! As I watched our teams compete all winter, I could not have been prouder,” said Director of Athletics Mark Conroy during the special athletic assembly. Mr. Conroy then gave the brief summaries of all nine winter programs. The boys thirds squash enjoyed a competitive season. The highlight of Coach Rutherford’s JV team’s season was a 4-3 victory over rival Suffield. Looking at the results, the varsity squash team, led by Coach Tyree, had a tough battle this season. With only two returning varsity players, it was a season dedicated to improvement and growth. Fortunately, the team made steady progress and as the season went on, rallies, games, and matches grew longer—all signs that the team was improving. The leadership of senior Captain Nile Buranasiri and number one player junior Kevin Li helped to pave the way for this growth, and the team headed for the Class C New England Tournament at Portsmouth Abbey with high hopes for good strong season ending performance. The boys did not disappoint. They took second-place as a team, grabbed two second-place overall trophies for senior Nile Buranasiri and sophomore Nick Hill, and a first-place overall for senior Loren Po! Congratulations, Loren! The girls squash program enjoyed another very successful winter season under the leadership of Varsity Coach Peter Gunn and JV Coach Adeleen Brown. The JV team made terrific progress during the season, with a highlight being a sweep of Suffield Academy in both of their matches. The girls varsity squash team enjoyed great team unity and competed valiantly throughout the season. The team benefited from exceptional senior leadership, led by captains Hannah Lee and Julia Valine and fellow seniors Tina Zhang, Fiona Li, and Hannah King. 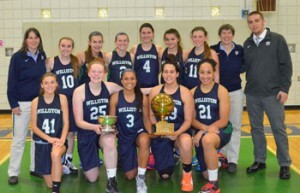 During the season, the team earned hard-fought victories over Ethel Walker, Canterbury, and Kent. As has usually been the case, the highlight of their season took place at the season ending NEPSAC Class C Championship held at Pomfret. At the tournament, the girls performed very well coming in third place as a team. Individually, both senior Julia Valine at #2 and sophomore Lindsay Whipple at #6 finished runner up in their respective flights, while senior Hannah King won three matches to take first place in the #7 flight. Congratulations, Hannah! The team received a wonderful honor at the end of the tournament when they were presented with the Sportsmanship Award. Congratulations, girls! Next year’s captain will be Caroline Borden ’16. Our wrestling program is led by Coaches KaneLong, White, Cho, and Rivenburgh. The wrestling team finished the season with a 9-10 team record. Highlights of their season were dual meet wins over Pomfret and Hotchkiss. Williston placed six (out of 11) wrestlers in the Class A League Championships and qualified five of them for the New England Tournament. The New England’s was highlighted by a 20th place finish out of the 46 teams represented at the tournament. Senior captain Sam Atkin’s third place finish at New England’s (after being a sixth seed) was a tremendous performance. Junior Mike Lloyd was also an All New England wrestler, as he finished eighth at the NE tournament. Sam’s finish qualified him to compete at the National tournament at Lehigh. Sam paced the team this winter with 32 wins, while sophomore Hunter Adams led the team with 21 pins. The captain of next year’s team will be Mikey Lloyd ’16. The boys swim team, though low in numbers, managed to earn impressive wins over NMH, Wilbraham and Monson, and Eagle Hill on their way to a 3-6 dual meet season. Each and every member of the team had a lifetime best performance over the course of the last two weeks of the season. Notable performances came from sophomore David Fitch, who won a NEPSAC title in the 100 yard freestyle and finished second in the 50 yard freestyle with the third fastest time in school history. Junior Calvin Frye also had a strong meet finishing in third place in the 100 yard freestyle. 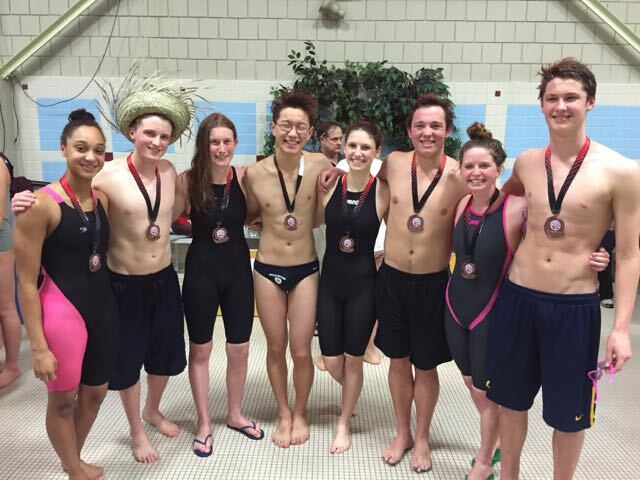 Both swimmers earned All-New England honors for their performances. Senior Captain Alex Li finished off a tremendous six-year Williston career with a fourth-place finish in the 100 backstroke and a sixth-place finish in the 100 butterfly, giving him top eight finishes in those events for the past three years in a row. Photo by David Koritkoski of the award winning relay teams from the Bud Erich Invitational on February 28. The girls swim team had a strong dual meet season, finishing 6-2 with convincing wins over rivals NMH, Kingswood Oxford, and Worcester Academy. The girls entered the last two weeks of their season very well-rested and swam incredibly fast—resulting in two new school relay records, four new individual school records, and a host of individual best times! Sophomore Gabriella Mercier was sidelined for the final three weeks of the season after breaking her finger in the dual meet against Suffield, but prior to that, she was having the single greatest season of any Williston diver in history. By that time she had already broken our 12-year old dual meet diving record as well as our 13-year old championship meet diving record. Congratulations, Gabby! The 200 medley relay team of Sally Alrutz, Natalie Aquadro, Jasmin Movassaghi, and Emily Yeager broke a 15-year old record which was set by four of the best swimmers Williston has ever produced—and they broke that record by over 2 ½ seconds! (This was also a NEPSAC Division 2 record.) The 400 freestyle relay team of Natalie Aquadro, Anabelle Farnham, Emily Yeager, and Sally Alrutz broke a seven-year old record by three full seconds! Finally, eighth grader Sally Alrutz re-broke her own record in the 100 yard backstroke, lowering the mark she set earlier in the season by nearly three seconds. She also broke a 15-year old record in the 100 yard butterfly, and in doing so, became the first swimmer in Williston history to go under the one-minute mark in both events! • 8th grader Sally Alrutz in the 100 backstroke. Sally also won her first NEPSAC title in the 100 yard butterfly and set a new NEPSAC Division 2 Record. The team’s terrific performance at the NEPSAC championship meet resulted in a second-place finish, narrowly losing to Dana Hall. The JV boys hockey team, led by Coaches Fay and Demerath, finished with a competitive 5-6-2 record. The team finished its season particularly well going undefeated in its last 5 games including a 5-2 victory over a playoff bound Minnechaug varsity team and a very satisfying 4-1 victory over Berkshire. Under Coaches Cunha, Hanford, and Kelly, the varsity boys hockey team enjoyed a terrific season, finishing with a record of 13-11-2. For the second year in a row, the team narrowly missed out on a playoff berth, staying in contention right down to the final days of the season. The season was full of some terrific victories, including wins over annual NEPSAC powers St. Sebastian’s and Westminster. The biggest highlight took place in early February when the boys knocked off then #1 ranked Loomis Chaffee team in a thrilling 4-3 overtime victory. The team was led this winter by captain Tyler Scroggins, who also led the scoring with 36 points, and goaltender Shane Mason, who had a strong season between the pipes and played 90 percent of the games. The team graduates a strong core group of 10 seniors who helped lead the program to 26 wins in the last two years. The JV team, led by Coaches Ward, Valine, and Thompson, enjoyed an excellent season, finishing with a 5-4-2 record. Highlights included two exciting 4-3 victories over Berkshire and Deerfield. 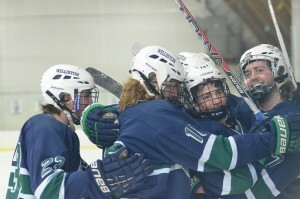 Varsity girls ice hockey enjoyed a TRULY remarkable season under the leadership of Coaches Talbot and Davey ,finishing with an incredible record of 20 wins, one loss, and four ties. This would be incredible record by any standard, but it was that much more amazing considering the team had only 14 players and only one of these 14 was a senior: Maddie Jerolman. The team’s 20 wins set a new school record for the most victories in a single season in our program’s history! The fact that our team went undefeated for 24 games in three months playing in arguably the top girls’ ice hockey league in the country is simply an incredible accomplishment. To say that the team played outstanding defense would be an understatement as they gave up a total of 20 goals in 25 games. Junior goaltender Morgan Fisher had eight shutouts. Highlights of their terrific season included a 3-0 road win at Tabor, a 2-1 overtime victory over Loomis, and beating Westminster 2-1. The girls won both of tournaments they competed in around the holidays: the Harrington Tournament and the Winchendon Tournament. The team’s undefeated regular season earned them their fifth postseason berth in six years, where they earned a #2 seed. In the quarterfinals, the girls beat Choate 3-1 before losing to eventual champion St. Paul’s 1-0 in the semifinals. In recognition of their outstanding seasons, juniors Delaney Belinskas and Rachel Rockwell were both named to the All New England Second Team. Awards will be posted following the varsity girl’s banquet night. Led by Coaches Hing, Kennedy, and Pelliccia, our ski teams enjoyed very successful seasons, competing in the Mountain Institute League. Benefiting from early season training at Mt Snow and Butternut, the team enjoyed a great deal of success during the weekly Wednesday races held at Berkshire East. The girls finished the season third place while the boys finished in fourth. 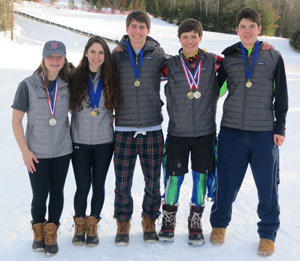 The season culminated with the New England Class B championships held at Ski Sundown in Connecticut. Both of our teams had terrific days competing with 14 other schools. 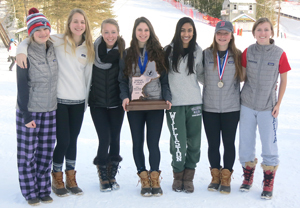 Highlights for the girls included senior captain Jen Carellas finishing eighth in the giant slalom and 6th in the slalom, while freshman Sophie Carellas finished second in the Slalom and fourth in the giant slalom. As a team, the girls finished in third place. Captain for next year is Sophie Carellas ’18. The boys also had a terrific day on the mountain. Senior captain Anthony Aquadro finished 10th in the slalom and sophomore Jess Cassuto finished fifth in the slalom. Sophomore Devin DeVerry continued his outstanding career on the slopes by finishing in third in the giant slalom and second in the slalom. There were over 50 competitors in each race. The boys’ team capped off the day by finishing in 1st place—winning their first NEPSAC championship in 22 years. Captain for next year is JJ Celentano ’16. This winter was another very successful season for our girls basketball program. The JV squad was competitive under Coaches Schneider and Johnson and finished with a 7-9 record. Highlights included an exciting two-point victory at Pomfret and decisive victories over rivals Suffield and Cushing. Varsity girls basketball, under Coaches Fulcher, Whipple, and Malinowski, had a terrific season, going toe to toe with the finest teams in Western New England and finishing with an 18-4 record. The 18 wins were the most wins since 20 in 2004. The team was led by an outstanding group of five four-year seniors: Natalia Baum, Dina Dahdul, Mar Harris-Kuiper, Mary McCarthy, and Gracie Simpson. There were plenty of highlights during the season including winning the Ray Brown tournament for the first time since 2005, sweeping their season series with rival Suffield, a huge road win at Cushing, and exciting victories over Class A teams from Taft, NMH, and Deerfield. 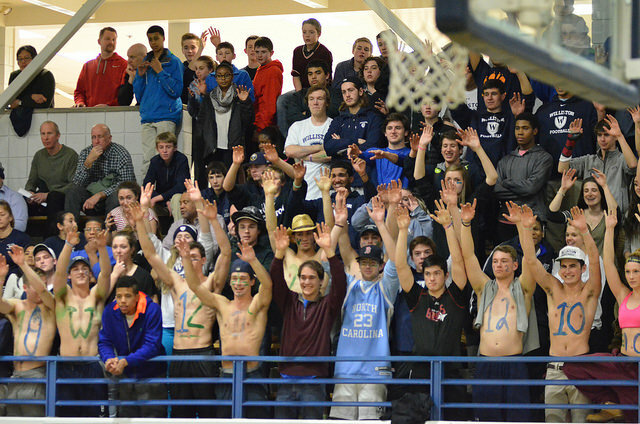 The team’s outstanding season earned them a #4 seed in the Class B Tournament and a rematch with Pomfret. In a tremendous game that saw the team rally from behind in the second half, the girls came up just short 59-56. Pomfret went on to win the NEPSAC championship. For her outstanding play during the Ray Brown Holiday tournament, senior and leading scorer Natalia Baum and Mary McCarthy were named to the all-tournament team. Three girls earned All New England recognition: sophomore Sarah Marion, and seniors Mary McCarthy and Natalia Baum. For Natalia, this was her third time being named to this team. Next year’s captain will be – Sarah Marion ’17. On the lower levels, the JV, 3rds and 4ths teams all competed well throughout their seasons. Coach Miller and Harper’s 4ths team had a strong season, finishing at 4-3 including a sweep of Eaglebrook. The thirds team, with great support from student assistants Jay Brennan and Kobe Terrelonge, finished with a 9-4 record with victories over Loomis, Deerfield, and Easthampton as highlights. The biggest highlights of the Cullen and Ketcham led JV season was a thrilling 48-45 overtime victory over Berkshire. Under the leadership of Coaches Shelton, Garrity, and Chase, the varsity boys basketball team enjoyed their finest season in memory, with a record of 23-3 including going 11-1 in Class A. The 23 wins were the most in school history. (In 1995, the boys team finished 20-2.) The team played proficient on both ends of the court, allowing 52 points a game while scoring an average of 67. The boys got everyone in New England’s attention in December when they defeated two time defending champion Exeter 68-66 nail-biter at Babson College. While there were many other great wins during the season, sweeping Loomis and Deerfield and an exciting two-point win over Hotchkiss at home were certainly highlights. The team’s outstanding season earned them the #2 seed in the Class A tournament where the boys earned the opportunity to host two games here at Williston. In the quarterfinals they beat a very tough Exeter squad, and in the semifinals they beat Tabor convincingly 66-51. Ironically, these two wins set up a rematch with rival Suffield Academy. The two teams had split their two-game series during the winter, each winning on the other’s home court. 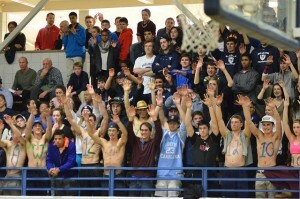 In a thrilling championship game held at Endicott College, the boys defeated Suffield 51-48. It was a great team effort. Senior Ryan Richmond was named the outstanding player of the tournament. For their outstanding play during the season, three boys garnered postseason recognition on the All New England team. Senior Ryan Richmond and junior Jake Ross made the second team, while junior Kyle Doucette was named honorable mention. Coach Mike Shelton was also named the NEPSAC Class A Coach of the Year.